Happy Monday everyone! We are in Monterey, California today. Mr. SBD (Sew BitterSweet Designs) and I are enjoying a couple days just the two of us, while Anne gets some much needed one on one time with her Nana and Baba (grandpa). I have the wonderful Kristy from Hopeful Threads here to tell you all about the March Project she is working on! Hi all! 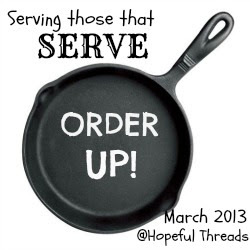 Kristy here from Hopeful Threads, and I’m delighted to get to share with you about our March Project! It’s time to kick off another fabulous sewing project designed especially with the purpose of giving back to a group of the most giving people I know of! This month we will be sewing for the people in our community that serve others regularly. More specifically, those that prepare and provide meals. This is one of those months that I’d like to encourage you to look within your own communities for an opportunity to give back. Is there a local church or community group that regularly provides meals for those in need? Does your community have a meal delivery service? A Food Pantry? Take a moment to consider who is feeding those in need around you. Perhaps your town/city has a Meals On Wheels program to help provide meals to Senior Citizens in their homes? Visit the Meals On Wheels Association of America here to see. Or maybe Mobile Meals is active in your community? Simply web search “Mobile Meals” + the name of your city to find out. We are going to be sewing to serve those that serve this month! Any type of kitchen accessory that can be handmade! Don’t have anywhere local to donate? Then you can of course send your items to me. I would be happy to include yours in my box! I will be donating my items locally, to The Love Kitchen. This incredible kitchen began in 1986. Currently, this amazing outreach is serving more than 2,000 meals a week in our community. Their volunteer-run kitchen is overflowing with people giving their time, energy and resources to help those around them. I want to encourage them in their work! I want to remind them how very important what they are doing is! I want them to be dressed in beautiful aprons, wearing and using beautiful handmade accessories while they are busy cooking up their love-filled dishes! I’ve created a Pinterest album full of all kinds of kitchen-y goodness! Links to free tutorials and patterns to help inspire and guide us as we sew. Find it here, Kitchen Wearables & Accessories.As you sew, I invite you to share what you’ve made and where you will be donating it in our March Project album here. I have all kinds of fun planned for the month and can’t wait to share it with you! If you have any questions or wish to mail your completed items to me, just email me. Love to have you grab our “Order Up!” badge from the Hopeful Threads blog and add it to your blog or website to help spread the word! Looking forward to sewing with you this month as we serve those who serve. I have a giveaway open for anyone interested in sewing along the prize is supplies to get you started. Today is the last day to enter as the winner announced 3/19. This entry was posted in Hopeful Threads. Bookmark the permalink. Thanks for sharing, hope you are enjoying your getaway!